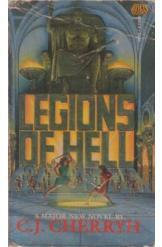 Legions of Hell by CJ Cherryh, Sci Fi. Book is in good condition, allpages intact. Julius Caesar and Brutus are reunited in hell with limited memory of each other, and pitted against the forces of damnation. Things only get sillier from there.